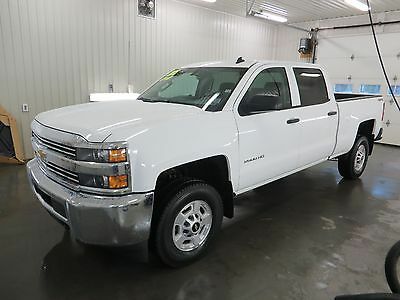 JUST LIKE NEW 2500 HD 4X4, POWER WINDOWS AND LOCKS, KEYLESS ENTRY, SATELLITE RADIO, ALLOY WHEELS, CREW CAB, 6.0L GAS READY TO GO!! TAKE ADVANTAGE OF YOUR STRONG US DOLLAR!!! GIVE CHAD MCVAY A CALL AT 506-755-2600, OR RYAN BROWN AT 506-467-7224. FREE AIR PORT PICK UP AVAILABLE IN BANGOR MAINE, SAINT JOHN NB, FREDERICTON NB, AND MONCTON NB. ZERO FEE'S! WE WILL MAKE THIS TRANSACTION VERY SMOOTH, EASY AND HASSLE FREE. ALL WARRANTY IS TRANSFERRED TO YOU. 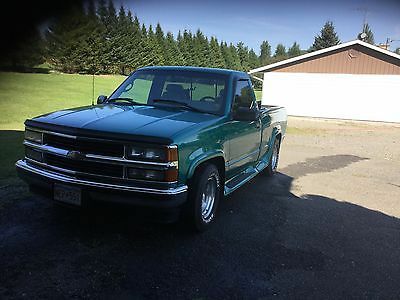 This truck is in excellent condition for the year, complete new exhaust system, new air conditioning pump, new cataletic converter, automatic, has summer and winter tires, hid away trailer hitch, power windows. 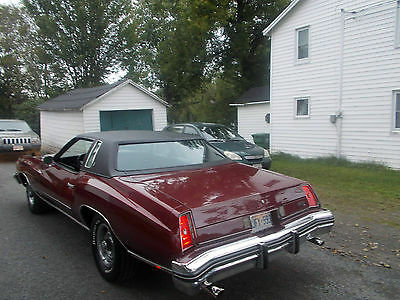 Beautiful ,Stunning monte carlo near mint ,MUST BE SEEN, its like a time capsule, you wont find a better one , pics dont do it justice im not a photographer , all original , low miles, 65 700 miles and i believe it to be true drives like new and the guy i bought it from in toronto last year assured me it was and i believe him , this has been a southern car most of its life North Carolina with absolutly no rust or bondo , car is straight !! ,and all american specs , it has a strong 400, 4 barrell engine , new ceramic headers, dual exhaust that is excellent , professional paint job that is in near perfect condition , new vinyl top recently installed ,all chrome is near perfect , underneath is very clean and under the hood .trunk looks new, even has the original spare tire and cover and mats ,i dont think that spare has ever been out , those long door hinges dont even rock not even a bit ,the interior is like new , no cracks anywhere , dash still looks new ,black interior , seats look 99 % new and i can honestly say they dont even look sat in , carpet is like new still shines , , all glass is great shape , all rubber door seals trunk etc in great shape , awsome rally wheels and brand new rubber t'a tires this year only about 1000 miles on them , this car drives as it should , near perfect , front end is great to, just had inspection and mechanic said it was the nicest shape car he ever seen , underneath is awsome , brake lines and all , this car has been in no snow ,oiled and garage kept all its life ,transmission shifts perfect ,power windows power seats airconditioning works but not real cold but cool ,power brakes and steering ,power door locks, you will love this car ,i love this car and you will to , ,its been just sitting in my garage collecting bit of dust, buy with confidence ,this is not junk, but it is a 41 year old car, but its awsome ,gas gauge isnt working properly. Car also comes with black cloth car cover in new shape, make me a cffer i cant refuse , no tire kickers or low ball offers , im to busy !.I will sell to anyone anywhere, buyers responsibilty for pickup and all shipping fees , also i have all documentaion for car , and last buyer from woodstock ontario in 2010, titles are here , also i have a copy of the appraisal from AUTO TECH appraisal services,from burgessville ontario from march 10 ,2010 appraisers name is Wayne Sexsmith,it was appraised at $ 15500 then ,mileage at that time was 62314 as stated in appraisal,and car has not hardly moved since i drove it home last year,i even have some documentation on a car show it was highlighted in at the great lakes drag raceing & car guys aug 2010 edition it even has the owners name witch i have on title so i believe it to be true , !! brian shelton ,it also states in the appraisal thats its a 400 engine and car has not been altered in any way , it also has a sticker on the rad cover under hood that says engine 400, I have described car as accurately as possible , buy with confidence ,Car comes with no warranty what so ever, sold as is where is . Also to us buyers , its easy to get this car to you all you have to do is call boarder and send vin number to them 48 hrs before crossing ,they will come out look at vin number and your off , thats all i had to do getting it to canada, good luck bidding ! 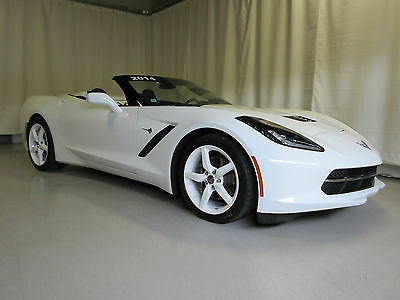 FOR SALE 1964 Corvette Stingray Roadster VIN # 40867 S 113637 1964 Corvette Stingray Convertible originally from California, 350 Cu. in. motor with a 4 speed Muncie transmission.This beautiful red Corvette with a white top and black leather interior runs and drives perfect. The transmission and rear end are numbers match to this car and there are NO squeaks or rattles and it shows 79,000 miles on the dial.....it has the following options : Leather seatsM20 4 speed manual transmission, close ratioJ50 Power BrakesU69 AM/FM Radio When I bought this car it was reported to me that this car was new in California and had been in 2 Walt Disney movies at some point, but I never was able to get the name of the 2 movies nor get the documentation from a previous owner to prove this....Later it was sold to a collector in British Columbia, Canada, where it lived for many years, and then was sold and went to an owner in eastern Canada in the province of Nova Scotia. It has always had good care and attention as you can see in the pictures and it has a "NO HIT" body and has never been in an accident !Also, this car has a brand new complete stainless steel exhaust system from the manifolds complete to the back, and has a completely new brake system including all new brake shoes, emergency cable, power booster,all new lines, and all new brake hoses...It will stop on a dime !As the pictures show it has a recent set of new Knock-Off wheels which have 4 new Michelin tires on them which make this Vette drive very nice. The convertible top is like new and is a 9 on a scale of 1 to 10.... I am not aware of what happened to the original motor, but this 350 in the car runs very well. The ignition has been changed to electronic so no worry about points going bad ! The correct Carter AFB carb has an electric choke, so the car starts up when cold with NO problem, has the correct twin snorkle breather, and the chrome ignition shielding too.! As in many mid year Corvettes, the clock does not work, but the other guages do and it shows just over 79,000 miles on the dial. 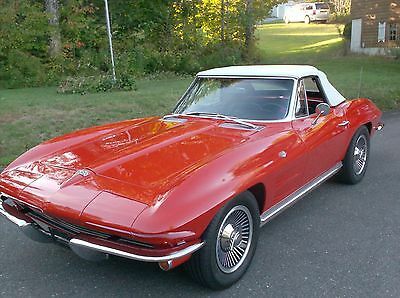 Everything about the appearance of this car is right, an original NO HIT body, red with white top, black interior and the knock off wheels make this Corvette beautiful. 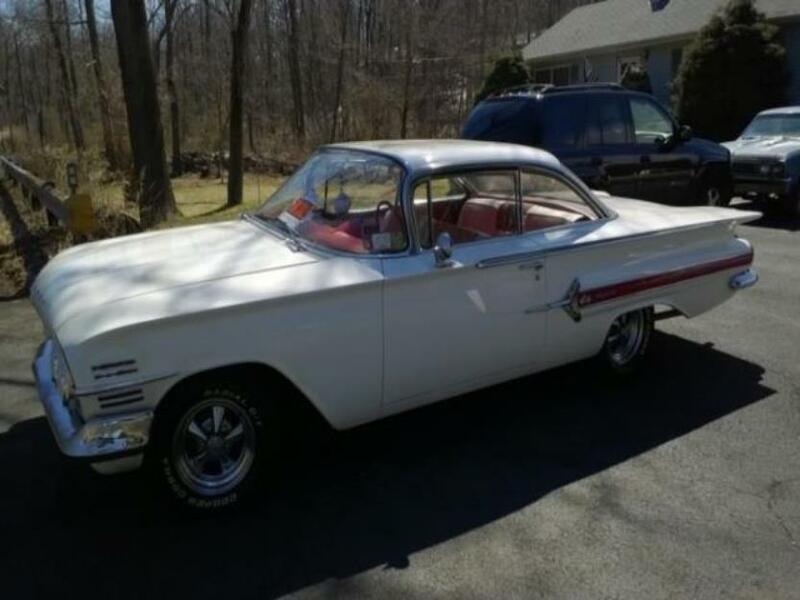 All emblems and chrome is like new as the pictures show, and you can get into this car and drive anywhere with no worries as it drives very well for a 64 Corvette. I am asking $39,500 U.S. dollars for this 1964 Stingray. I need to sell to finish another project I am working on. If you are looking for a very nice early 60's Corvette, this could be the one for you....for more information please call 506-696-4483....and for you US buyers, I will pay all brokers fees so not to worry about getting this car across the border...will not be a problem..look forward to hearing from you. ! The car has a 1965 hood on it but the proper 1964 hood goes with it as seen in the last picture. 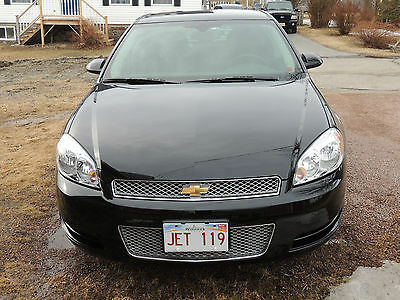 Convertible with Black Soft top, RWD, 6.2L V8 w/ 460 hp, 6 Speed auto w/ Paddle Shift, A/C, Bluetooth, Cruise Control, Power All, Chevrolet MyLink CD/SiriusXM Sat/MP3/Touchscreen Navigation with USB Port and Audio Jack, Steering Wheel Audio Controls, 18 inch Front and 19 inch Rear Aluminum Rims. 18,899 Kms (11,250 Miles) Odometer is in Kilometers. All Trades will be considered. Financing is available to Canadian buyers. Beautiful Corvette Stingray,Same owner for 28 yrs. Always stored in heated area.This car has been pampered and well maintained.All matching # and equipped with 327 350 hp motor and 4 speed transmission. 1958 Chevrolet Panel Van. 350 stroked 11:1 compression, World heads 2.02/1.60. Eagle forged crank & rods. SRP forged pistons. Elgin cam. Harland Sharp rockers. MSD Ignition. 600 Holley carb. 350 turbo transmission. 3.73 rear end. Camaro sub frame. 4 wheel disc brakes. 3 inch exhaust. Cadillac seats. Sunroof ( power currently disconnected). This truck is very scarce and great to drive anywhere. I purchased this truck in California several years ago. This truck is rust free & straight. 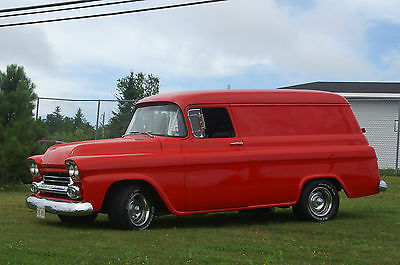 This truck is for sale locally & I reserve the right to end the auction early. Shipping is the responsibility of the new owner. I will help load to ship anywhere in USA or Canada. Bidders with less than 5 positive feedback need to call first before bidding or the bid will be cancelled. $1000.00 deposit within 48 hours of sale. Remainder in 7 days. Paypal , cash or certified bank draft. funds must be cleared before vehicle leaves. This truck is in Saint John, New Brunswick, Canada. (Atlantic Time Zone). Call Mike at 506-650-5148. Power pack, upgraded to a dual master cylinder, power steering, day/night mirror/ original jacking instructions and original jack. The interior is in beautiful condition as well as the dash and gauges. She has cragar wheels and raised white letter tires. It is like driving on a cloud and runs just great.